On Saturday, 24 November 2018, MANATESOL members and local English language teachers enjoyed an afternoon of professional learning at a two-hour workshop hosted by English Language Partners (ELP) Taranaki. Dana Taylor from IPU New Zealand Tertiary Institute, Palmerston North and Gwenna Finikin from Hokowhitu School, Palmerston North shared teaching tips and techniques for encouraging students to participate fully in speaking activities and helping young learners pronounce sounds and recognise words accurately. Dana started off her workshop by having everyone mingle and ask each other questions about speaking activities in the language classroom. Participants then discussed aspects of a successful speaking activity, identified challenges faced by learners when speaking in class, and suggested solutions to encourage all students to contribute. Dana explained the three Ts of speaking activities (relevant and motivating topic, level-appropriate and scaffolded task, and linguistic tools—useful target language structures), before the whole group shared ideas for getting quieter students to interact. In Gwenna’s presentation after the refreshment break, participants heard about the results of a small case study on the effectiveness of teaching low-level learners using synthetic phonics. Gwenna compared these results with those obtained from teaching learners using a more whole language approach. Following her slide show, Gwenna shed light on the different parts of a synthetic phonics lesson and demonstrated how phonics activities can be used with a variety of learners. 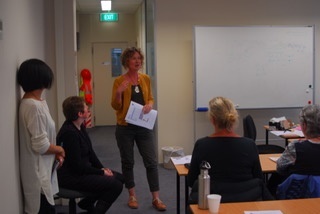 Before finishing the workshop, Gwenna and Dana encouraged participants to consider establishing a TESOLANZ local branch in New Plymouth so they could have access to more professional development sessions. Participants were keen to discuss this idea, since they appreciated the useful topics covered in the workshop and the interesting conversations during morning tea and after the session. 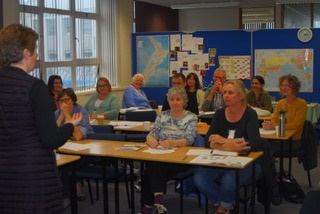 “I thoroughly enjoyed the TESOLANZ workshop and hope they will do it again next year,” said one teacher. ELP Taranaki Centre Manager Yuka Kobayashi was also pleased with the workshop’s success and is hoping to host more workshops in New Plymouth in future. MANATESOL wishes to thank ELP Taranaki for hosting the event and Irene Young for taking these photos during the workshop.